What are the right disability rules for robotaxis? 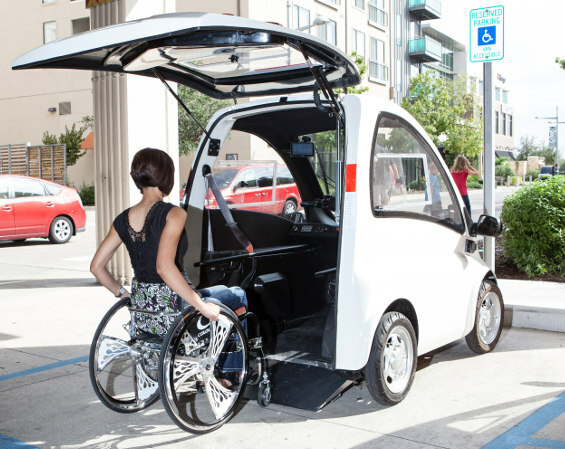 Robocars are broadly going to be a huge boon for many people with disabilities, especially disabilities that make it difficult to drive or those that make it hard to get in and out of vehicles. Existing disability regulations and policies were written without robocars in mind, and there are probably some improvements that need to be made. While I was at Google, I helped slightly with the project to show the first non-employee getting to use the car to run errands. The subject we selected was 95% blind, and of course he can’t drive, and even using transit is a burden. It was obvious to him immediately how life-changing the technology will be. There are two rough policy approaches to making things more accessible. One requires that we make everything accessible. The other uses special accommodations for the disabled. Making everything accessible is broadly preferred by advocates. Wheelchair ramps on all public buildngs etc. Doing less than this runs a risk of “separate but equal” which quickly becomes separate and inferior. It’s also hugely expensive, and while that cost is borne by people like building owners and society, there is not unlimited budget, and there are arguments that there may be more efficient ways to spend the resources that are available. There are also lots of very different disabilities, and you need very different methods to deal with impairments in sight, mobility, hearing, cognition and the rest. Over 50 million people in the USA have some sort of disability, so this is no minor matter. There are Americans with Disabilities Act rules for taxis. Regular sedan taxis are not directly regulated though there can be no discrimination of disabled customers who are capable of riding in a sedan. Any new van of up to 8 seats has to been accessible, which often means things like wheelchair lifts. In addition, once a taxi fleet has accessible vans, it has to offer “equivalent service” levels. This might mean that if it has 200 sedans, it can’t buy just one van because there would be much longer wait times to get that van. To get around this, a lot of companies use a loophole and purchase only used vans. The law only covers the use of new vans. Companies like Uber and Lyft don’t own vehicles at all, and so are not governed in the same way by fleet requirements, though they do offer accessible vehicle services in some cities. When Uber and similar companies move to offering robotaxi service with vehicles they own, these laws would apply to them. Unlike some companies, the used van loophole will also be difficult since most robotaxis will be custom built new. Robotaxi service offers the promise of a vehicle on demand, and it offers the potential of a vehicle well fitted to the trip. Mostly I talk about things like the ability to use a small and inexpensive one person vehicle for solo urban trips (which are 80% of trips, so this is a big deal) but it also means sending an SUV when 3 people want to go skiing, or a pickup-truck for a work run, or a van designed for socializing when a group of people want to travel together. It also offers the ability to create vehicles just for people with certain disabilities. 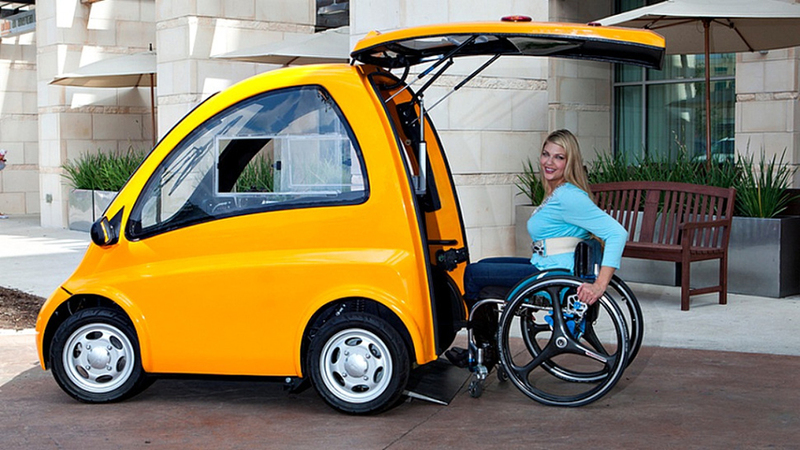 One example I find quite interesting is the Kenguru — a small, single person vehicle which is hollow, and allows a user in a wheelchair to just roll in the back and steer it with hand controls. For wheelchair users with working arms, this is hugely superior to designs that require you to get out of your chair into a car seat, or which involve the time delays of using a wheelchair lift. Especially with nobody to assist. Roll-in, roll-out can match the convenience of the able-bodied. The current Kenguru is to be steered, but a self-driving vehicle like this could handle even those in power chairs, and offer a fold-down bench for an able-bodied companion. Being computerized, these vehicles will also offer accessible user interfaces. Indeed, they may mostly rely on the user’s phone, which will already be customized to their needs. Custom-designed to meet particular disabilities, these vehicles will both serve the disabled better and frankly be not that useful for others. As such, regimes that require adapting all vehicles to handle both types of customers may have the right spirit, but provide inferior service. Another key benefit of robotaxi service for the disabled will be the low price. Reduced job prospects drive many with disabilities into poverty. Service that is naturally low in price will be enabling. Providing “equivalent” service is difficult with traditional taxis, particularly for smaller fleets. Robotaxis, which don’t mind waiting around because no human driver is waiting, make this easier to do. The service level of a robotaxi service is based on the density of currently unused vehicles in your area. Increase fleet size with the same demand, and service level goes up. As long as fleet size is not way overblown, so that vehicles still wear out by the mile rather than by the year, increasing fleet size is not nearly as expensive as it is for regular cars or human driven taxis. This means you can, fairly readily, offer equivalent or even superior service at a pretty reasonable cost. As long as disabled-designed vehicles are made in decent quantities to keep their costs low, the cost should be close to the cost of regular vehicles. 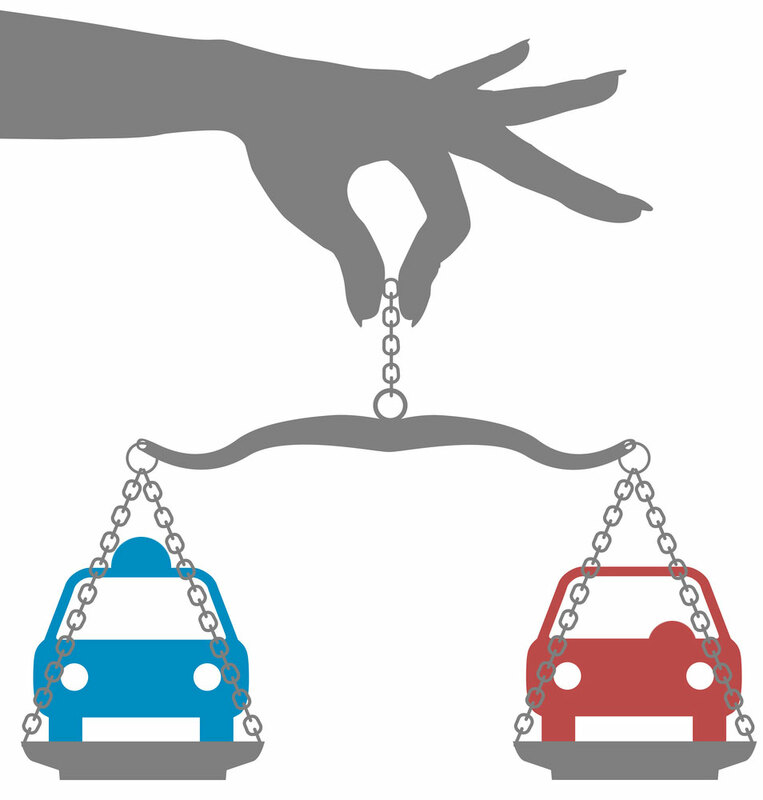 In the public interest, regular vehicle customers might subsidize the slightly higher cost of these lower volume vehicles. Slightly more advanced notice of rides will often make it possible to provide service at lower cost. Regular vehicles will naturally be present on every block. Disabled vehicles might be present with less density during high use times, but the ability to reposition lets even slight advance notice do a lot. For those in groups, it may not be easy to carry a person in a wheelchair along with several non-wheelchair passengers. This might mean the wheelchair passenger goes in their own vehicle (with videoconference link.) This is not as good, but is much more cost effective than requiring every van to have a wheelchair lift. 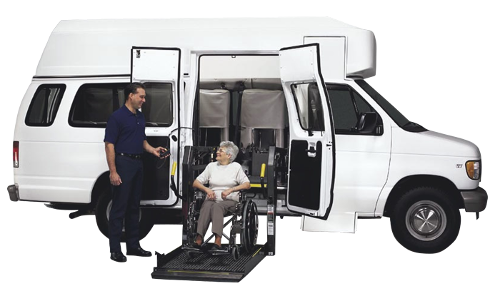 To increase service levels, it is likely competing companies would cooperate on serving the disabled, and pool fleets. Until the disabled become a profitable market rather than one done to meet goals of public good, companies will prefer to work together. As such if you call for an Uber, you might often get a Lyft or other small fleet car. Low cost disabled transport may mean that accessible public transit and paratransit slowly fade. Public transit which has its own tracks will continue to be accessible as it offers a speed advantage which may not be met on the roads, but otherwise it may be much cheaper to offer private robotaxis than to make all transit accessible. This would mean a group of people might not be able to ride transit together if it’s not accessible. Small electric vehicles may be allowed to enter buildings, dropping passengers right at elevator lobbies or other destinations. The biggest trade-off will be the loss of social group experiences. There certainly will be buses and vans with lifts which allow groups of mixed-ability passengers to travel together, but it is unlikely these would be so common as to offer the same service level as ordinary vans. With advance notice of just 10 minutes, they could probably be available.